Because we don’t live in sunnier climes, injecting some colour and print into your home can work wonders and one of our favourite trends is tropical brights. It might be something to do with the Olympics being held in Rio de Janeiro this summer, but the shops are full of bold goodies. 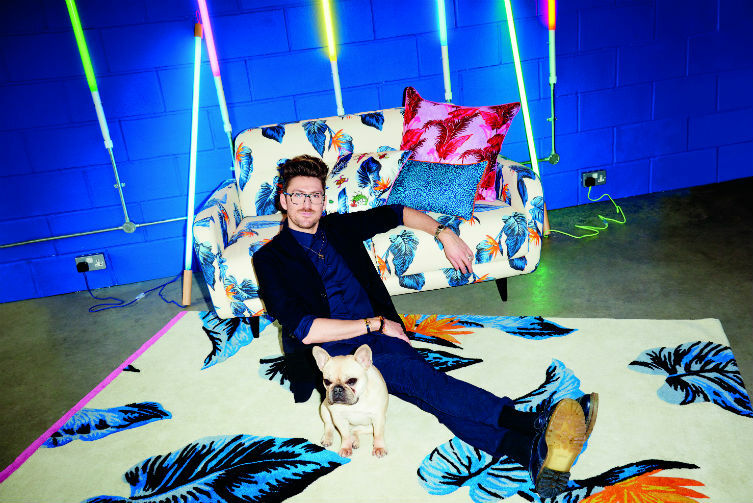 We love the new Henry Holland x Habitat range (from £35 – http://www.habitat.co.uk/henry ), which takes inspiration from his Spring/Summer 2016 catwalk collection. For smaller budgets try the George Home Copper Effect Pineapple Table Lamp (£20) or ‘Sun Shine On My Mind’ tropical print teatowel from H&M (£2.99). It’s not everyone’s dream to live in a ‘footballer’s wife’s’ house with shiny appliances and everything matching. If you want to integrate a variety of finishes one place you could start is in the kitchen. Combine wooden cupboard doors with marble or granite worktops or concrete finish floors with gold / metallic finishes. We love Ikea’s kitchen solutions as you can mix and match doors for that bespoke kitchen feel. Having metallic home accessories in your space is still a strong trend and these shiny finishes are particularly effective in kitchens and bathrooms. Gold, brass, copper and rose gold can sit nicely in any room to add a modern, warm tone that moves away from the cold, sometimes soul-less feel of stainless steel and silver. Take a look at lighting from Next featuring bronze table lamps and pendants or Zara Home sells ‘Golden’ stainless steel cutlery and fruity apple and pear gold finish salt and pepper shakers . Cox & Cox also have some timeless glass bathroom accessories with brass lids. Interior trends often take a lead from what’s on the catwalks, and this season is no exception. Victoria Beckham, DKNY and Missoni all showcased monochrome (black and white) in the form of stripes, ruffles and geometric dresses, tops and trousers and it’s easy to introduce this strong graphic print into your home. Marks & Spencer has a variety of monochrome thanks to a bold new crockery collection by Sue Timney (from £6) that will definitely impress your dinner guests. If subtle is more your thing, then their Manhattan collection features a simple black line on white or you can jazz up teatime with an Alphabet Mug (£6). From the smallest touches to a larger scale project, these are easy ways to update your home style statement, even for those renting a property. Sign up to get our blog posts on all things property related straight to your inbox. For an honest and realistic valuation of your home – for sale or rent – call us on 020 3538 0558 or email info@mi-move.com . We’re also happy to advise on what small changes you can implement to make your home more attractive to renters or buyers.